Objective: Vernonia amygdalina, commonly known as Bismillah leaves has emerged as Malaysian herbal armament with potential health benefits. The aim of this study was to evaluate the cytotoxic activity effect of different number polarity solvent extracts for Bismillah leaf and observed morphological changes of human glioblastoma multiforme cell line (U-87). Methods: Brain tumours are the priority care to be treated using alternative method as it is the second main movement of cancer related deaths. Among all types, glioblastoma multiforme (U-87) had known for the most aggressive type as after through the standard surgical procedure, the endurance still very short due to high-resistance. Thus, cell line of U-87 was chosen as a model in this study. For Bismillah leaf extraction, three solvents were used; ethanol, methyl alcohol and ethyl acetate. The cytotoxic activity of the extracts then was evaluated using MTT assay and the cell morphology was observed using light microscope. Results: The ethyl acetate extracts of Vernonia amygdalina reach IC50 with 48.0 ± 26.72 μg/ml. The methanolic and ethanolic extracts shown no value of IC50; but there was significantly difference value (p<0.05) between concentration of 100 μg/ml, 50 μg/ml, 25 μg/ml, 12.5 μg/ml, 6.25 μg/ml, 3.125 μg/ml and 1.563 μg/ml of ethanol extract on cytotoxicity study in U-87. Conclusion: In this study done with three solvents polarity used, only Bismillah leaves of ethyl acetate extracts displayed cytotoxic activity to U-87 cell line. Therefore, this plant could be an important source of safer cytotoxic compounds for glioblastoma multiforme cancer cell lines. Even so, it was indicated that specific mechanisms of anti-proliferative effects of Vernonia amygdalina extracts to be examined in the hereafter. As well, more trials should be further conducted on a bigger scale to evaluate the efficacy of the purported discussion. Vernonia amygdalina, Cytotoxic activity, Cell line (U-87), Ethyl acetate extracts. The National Cancer Institute estimates that 22,850 adults were diagnosed with brain and other nervous system cancer in 2015. It also estimates that in 2015, 15,320 (67%) of Glioblastoma Multiforme (GBM) patients resulted in death . GBM has an incidence of 2 to 3 per 100,000 adults per year, and accounts for 52% of all primary brain neoplasms. These neoplasms tend to pass off in adults between the ages of 45 and 70 . Because most patients with GBMs die of their disease in less than a year and essentially none has long-term survived, these tumours have drawn significant attention; nevertheless, they have evaded increasingly clever and intricate attempts at therapy over the last half-century . GBM is the most aggressive of the gliomas, a collection of tumours arising from glia or their precursors within the central nervous system. Clinically, gliomas are divided into four grades; unfortunately, the most aggressive of these, grade 4 or GBM, is the most common . Regardless of standard treatments consisting of surgical procedure such as postoperative radiotherapy and Temozolomide (TMZ), patient endurance still remains poor, primarily attributed to tumour inherent radio-resistance and chemo-resistance [3,4]. One of the causes for the resistance of GBM is the complex part of the tumour itself. As the name implies, glioblastoma is multiforme. It is multiforme grossly, showing regions of necrosis and haemorrhage and it is multiforme microscopically . Thus, a deficiency of the therapeutic selections and the necessity to improve the quality of life patients made researchers explored the alternative or complementary courses of therapy available [5,6]. Huda-Faujan et al. had detailed that plants and fruits are an important and a possible source of natural antioxidants that can defend the human physical structure from the free radical scavenging action. Specifically, in the treatment of GBM, previous literature reveals that the antioxidant compounds from plants defend it by scavenging free radicals and normalizing the oxidative state in the body [8-10]. Due to this, researchers had given great attention to the antioxidant properties, because of their benefits in the prevention of coronary heart disease and cancers, specifically . Vernonia amygdalina is one of plant that been studied for its benefits; is a family member of the Asteraceae. It was known as a shrub or low tree that can reach upwards of 10 m in height and trunk diameter of 40 cm . Recently, it was taken into the Malaysian as herbal armament and had been known to care for diabetes, high blood pressure and hypercholesterolemia. In nature land, it is an herbal plant and can be consumed after through a detoxification process, a process in which leaves were boiled several times while changing the urine and was worked on endlessly until the bitterness redux . Meanwhile, extracts from the leaves had been studied can possess hypolipidemic, antihyperlipidemic [14-16], eczema, measles and anaemia . Since ancient, the benefits of polyphenols have been recognized for high antioxidant activity and are protective to defend tumours in the torso. Previous surveys had revealed that Vernonia amygdalina to be highly antioxidant polyphenols and already been considered to involve in anticancer activity against several tumours [18,19]. Khalili et al. had studied the antioxidant activities of Vernonia amygdalina extracts measured using Ferric Thiocyanate (FTC) method; and it found that ethyl acetate extracts displayed the maximum phenolic content (2.693 mg/g), tailed by chloroform and methanol extract. These disclose that there is a positive correlation between total phenolic content and antioxidant activities overall . Thus, this study was aim to evaluate the cytotoxicity study and morphological changes of different extraction for Vernonia amygdalina in U-87 cell lines. Previously, the anticancer activity of Vernonia amygdalina extract was first study in human carcinoma of nasopharynx and leukaemia cells P-388 and L-1210 [22,23]. From the latest literature review, Vernonia amygdalina extract had focused on MCF-7 [20,24] and HT-29 cell lines  using MTT assay. Because the elimination of cancer in the early levels is an entire part of chemoprevention, measuring anti-proliferative properties against cancer cells using a common assay, such as the MTT assay, provide useful insight on the chemo-protective potential of natural extracts. The steps used previously by Khalili et al. were adopted for this study. Bismillah leaves were obtained at the state of Terengganu in Malaysia, as their natural habitats. The leaves were cleaned, dried in the drying oven (40˚C) and land to fine powder. Then, three types of extracts were produced by a sequential soaking process (1:10; w/v) with ethanol, methyl alcohol and ethyl acetate in Erlenmeyer flasks. The flasks were then left for 24 h at room temperature (24-25˚C) and were filtered through Whatmann® No. 40 filter paper (pore size 20-25 μm). The extracts were concentrated under reduced pressure with a rotary evaporated at 40˚C. These crude extracts were kept at -20˚C until use. A stock solution (1 mg/milliliter) was prepared in DMSO. And so, working stock solutions of the extract was developed by serial dilution from 1 mg/ml diluted in RPMI-1640 (Sigma, MO, USA) medium with serum to obtain concentrations 100.0, 50.0, 25.0, 12.5, 6.25 and 3.125 μg/ml. The extract solutions were maintained at 4C along the experimentation. Human Glioblastoma multiforme cell line (U-87) and NIH 3T3 mouse fibroblasts were held previously from a research lab at the Department of Biotechnology, Universiti Sultan Zainal Abidin. The cells were cultured in RPMI-1640 (Gibco) supplemented with 10% Foetal Bovine Serum (FBS). Cells were incubated at 37˚C with 5% CO2 and maintained in the linear stage of development. For the morphological analysis, U-87 cell line and NIH 3T3 mouse fibroblasts were seeded in 96-well plates at 2.0 × 105 cells/millilitre. The cells were treated with extracts of ethanol, methanol and ethyl acetate for 24, 48 and 72 hours . At the indicated time points, any morphological changes occurring with the cells were examined and recorded under a light microscope (Nikon, Japan). The effects of Vernonia amygdalina leaves with ethanol, methanol and ethyl acetate on the viability of the U-87 cell line and NIH 3T3 mouse fibroblasts were studied after 24, 48 and 72 hours of treatment. The stock solution of 1000 μg/ml was further serial diluted to obtain concentrations of 100.0, 50.0, 25.0, 12.5, 6.25 and 3.125 μg/ml; performed in triplicates. The cells were seeded into 96-well plates in a volume of 200 μl/ well at a density of 2.0 × 105 cells/ml and grown at 37˚C in a humidified 5% CO2 incubator. The cell viability was measured by a quantitative colorimetric assay using MTT (20 μg/ml), which is based on the conversion of MTT to formazan crystals by mitochondrial dehydrogenase. Water soluble MTTformazan crystals formed inside the support cells were then removed and DMSO (100 μl) was added into each well. The absorbance at 570 nm proportional to the number of living cells was measured on a flourometer micro-plate reader (TECAN, INFINITE M200). The data were expressed as a percentage of control. In this study, the cytotoxic activity of U-87 cell lines using solvents of ethanol, methanol and ethyl acetate of Vernonia amygdalina was investigated by using the MTT assay. MTT assay is the basis for numerous in vitro assays that includes only the measurement of cell viability and proliferation. Compound from MTT is reduced from an insoluble purple formazan into an insoluble coloured formazan product of mitochondrial dehydrogenase activity of viable tumour cells, which can be measured spectrophotometrically after dissolution. Numerous extractions were used to determine the relationship between the number of cells and the amount of MTT formazan generated and between the amount of MTT formazan generated and the duration of cell incubation with MTT . Cell proliferative activities were measured by comparing the purple colour formations. Under the experimental conditions of this study, the enzyme activity and number of formazan formed were proportional to the number of cells. Reduction in the number of cells by a particular agent (cytotoxicity) can generally be explained by cell killing and/or inhibition of cell proliferation. Other than that, The IC50 value, experienced as the drug concentration caused 50% suppression of tumour cells was used as a parameter for cytotoxicity in research . The result of these three different polarity solvents of Vernonia amygdalina leaves on the NIH 3T3 mouse fibroblast in cytotoxic study were assessed at 0, 24, 48 and 72 hours after treatment with serial dilution of the selections. When the experimental media were treated under control conditions, the 3T3 cells appeared healthy and produced up to 90% of confluency. The cell displayed characteristic features of different branch and polygonal shape. All solvents show negative results for anti-proliferative effect. The effect of ethanol extracts of Vernonia amygdalina leaves on the human glioblastoma multiforme cell line (U-87) changes in cell morphology were assessed at 0, 24, 48 and 72 hours. When the experimental media were treated under control conditions, the U-87 cells appeared healthy and produced up to 90% of confluency. The cell displayed characteristic features of different branch and polygonal shape, same as cell control 3T3. As shown in Figure 1, ethanol extracts of Vernonia amygdalina leaves do not showed cytotoxicity effect to U-87 cell line. At the highest concentration, this extracts didn't achieve IC50 value for 0 hours, 24 hours, 48 hours, and 72 hours. However, there was significantly different value (p<0.05) between different concentration of 100 μg/ml, 50 μg/ml, 25 μg/ml, 12.5 μg/ml, 6.25 μg/ml, 3.125 μg/ml and 1.563 μg/ml of human glioblastoma multiforme cell line (U-87). 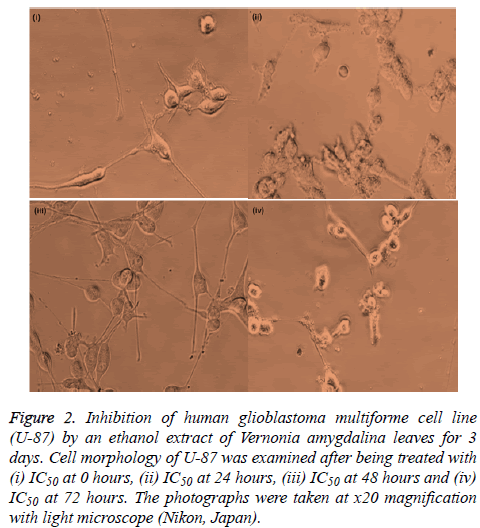 Figure 1: Inhibition of human Glioblastoma multiforme Cell Line (U-87) by an ethanol extract of Vernonia amygdalina leaves on time dependent at (i) 0 hours, (ii) 24 hours, (iii) 48 hours and (iv) 72 hours. * Values shown are means of 3 independent experiments. The cell growth of treated groups was standardized with an untreated control group as A/A0 (%), where A is the value of A570 generated at a given concentration of extracts by MTT assay, A0 is from the untreated control group. Statistical differences were analyzed by oneway ANOVA test. *p<0.05. At 0 hours, 24 hours, 48 hours and 72 hours treatment with ethanol extracts, the cell displayed the characteristic features of different branch and polygonal shape, same as cell control. There are no displayed characteristics of cell shrinkage, rounding, partial detachment and lobulated appearance of apoptotic cells as shown in Figure 2; at x20 magnification of light microscope). The ethanol extracts in this study failed to produce any significant structural changes. Figure 2: Inhibition of human glioblastoma multiforme cell line (U-87) by an ethanol extract of Vernonia amygdalina leaves for 3 days. Cell morphology of U-87 was examined after being treated with (i) IC50 at 0 hours, (ii) IC50 at 24 hours, (iii) IC50 at 48 hours and (iv) IC50 at 72 hours. The photographs were taken at x20 magnification with light microscope (Nikon, Japan). The result of methanol extracts Vernonia amygdalina leaves on the human glioblastoma multiforme cell line (U-87) changes in cell morphology were assessed at 0, 24, 48 and 72 hours. When the experimental media were treated under control conditions, the U-87 cells appeared healthy and produced up to 90% of confluency. The cell showed a different branch and polygonal shape, which is considered as the normal cell growth effects as 3T3 cell line. Based on Figure 3, methanol extracts of Vernonia amygdalina leaves do not show the cytotoxicity effect to U-87 cell lines. At a concentration of 100 μg/ml, this extract did not reach IC50 to test cells for 0 hours, 24 hours, 48 hours, and 72 hours. Contrary with the study done by Khalili et al. , cytotoxic activity of methanol extracts of Vernonia amygdalina to MCF-7 and HT-29 cell lines ranges from 2.50 to 1.20 μg/ml. Methanol extract reveals to have high cytotoxic activity towards the HT-29 cell line with the IC50 value of 1.20 μg/ml followed by MCF-7 (2.50 μg/ml). Figure 3: Inhibition of human glioblastoma multiforme cell line (U-87) by methanol extract of Vernonia amygdalina leaves on time dependent at (i) 0 hours, (ii) 24 hours, (iii) 48 hours and (iv) 72 hours. * Values shown are means of 3 independent experiments. The cell growth of treated groups was standardized with an untreated control group as A/A0 (%), where A is the value of A570 generated at a given concentration of extracts by MTT assay, A0 is from an untreated control group. Statistical differences were analyzed by one-way ANOVA test. *p<0.05. At 0 hours, 24 hours, 48 hours and 72 hours treatment with methanol extracts, the cell displayed the distinctive features of different branch and polygonal shape, same as cell control. There is no major present of cell shrinkage, rounding and partial detachment and demonstrated the lobulated appearance of apoptotic cells. As supported by images in Figure 4 (at x20 magnification of light microscope), this extract did not reach IC50 to test cells for 0 hours, 24 hours, 48 hours, and 72 hours. The methanol extract of Vernonia amygdalina leaves in this study failed to produce anti-proliferative effect. 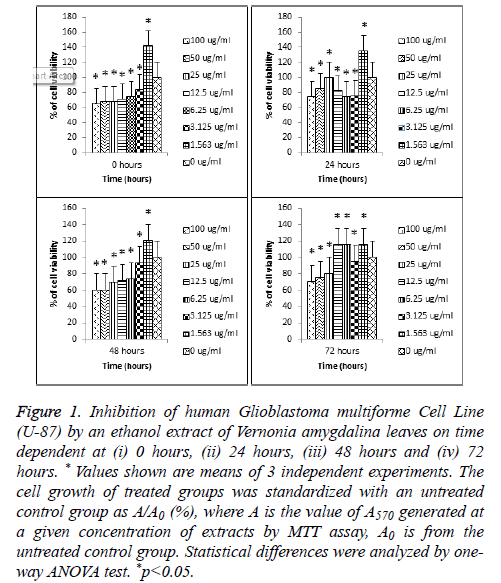 Figure 4: Inhibition of human glioblastoma multiforme cell line (U-87) by methanol extract of Vernonia amygdalina leaves on time dependent at (i) 0 hours, (ii) 24 hours, (iii) 48 hours and (iv) 72 hours. * Values shown are means of 3 independent experiments. The cell growth of treated groups was standardized with an untreated control group as A/A0 (%), where A is the value of A570 generated at a given concentration of extracts by MTT assay, A0 is from an untreated control group. Statistical differences were analyzed by one-way ANOVA test. *p<0.05. 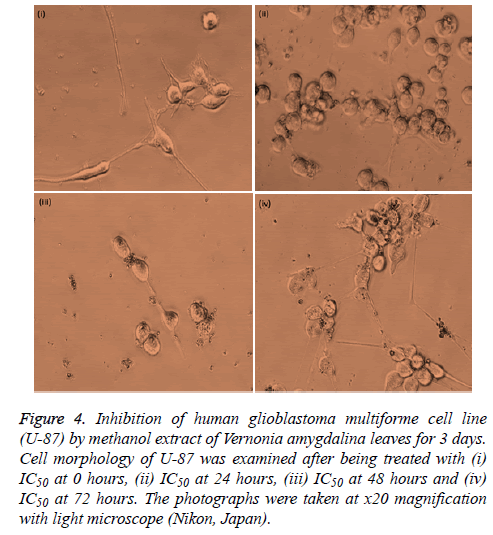 The effect of ethyl acetate extracts of Vernonia amygdalina leaves on the human glioblastoma multiforme cell line (U-87) changes in cell morphology were assessed at 0, 24, 48 and 72 hours as shown in Figure 5 When the experimental media were treated under control conditions, the U-87 cells appeared healthy and produced up to 90% of confluency. The cell showed a different branch and polygonal shape, which is regarded as the normal cell growth issue. 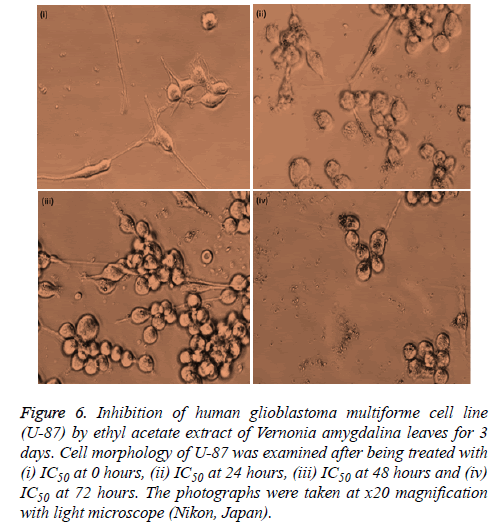 Figure 5: Inhibition of human glioblastoma multiforme cell line (U-87) by ethyl acetate extract of Vernonia amygdalina leaves on time dependent at (i) 0 hours, (ii) 24 hours, (iii) 48 hours and (iv) 72 hours. * Values shown are means of 3 independent experiments. The cell growth of treated groups was standardized with an untreated control group as A/A0 (%), where A is the value of A570 generated at a given concentration of extracts by MTT assay, A0 is from the untreated control group. Statistical differences were analysed by oneway ANOVA test. *p<0.05. Based on Figure 6 (at x20 magnification of light microscope), ethyl acetate extracts showed cytotoxic activity on morphological changes. At a concentration of 100 μg/ml, this extract reaches IC50 to test cells after 72 hours incubated. This extract also had shown its anti-proliferative effect from previous study to HT-29 and MCF-7 cell lines and the results showed strong cytotoxic activity with the IC50 value of 4.60 μg/ml and 8.50 μg/ml . Yet, present result showed the ethyl acetate extracts potential to be cytotoxic towards U-87 cell lines with IC50 values of 48.0 ± 26.72 μg/ml. Figure 6: Inhibition of human glioblastoma multiforme cell line (U-87) by ethyl acetate extract of Vernonia amygdalina leaves for 3 days. Cell morphology of U-87 was examined after being treated with (i) IC50 at 0 hours, (ii) IC50 at 24 hours, (iii) IC50 at 48 hours and (iv) IC50 at 72 hours. The photographs were taken at x20 magnification with light microscope (Nikon, Japan). At 0 hours, the cell showed a different branch and polygonal shape, which is conceived as the cell control. After 24 and 48 hours of treatment with ethyl acetate extract, there are some cells that displayed shrinkage. It may due to significant reduction in cell volume for their first stage of apoptosis. Moskwa et al. had stated that the easily identifiable morphological features of apoptosis are when some cells were in the early stages of apoptosis with chromatin condensed into the nuclear membrane forming crescent-shaped structures. However, there are cells that displayed characteristic features with branches and polygonal shape as shown in Figure 6; (at x20 magnification of light microscope). After 72 hours of treatment with ethyl acetate extract of Vernonia amygdalina leaves, the human glioblastoma multiforme cell line revealed the characteristic features of cell shrinkage, demonstrated the lobulated appearance of apoptotic cells and rounding and partial detachment of cells. As supported by data in Figure 5, this extract did reach IC50 to test cells after 72 hours treatment with the extracts. The purpose of this study was to evaluate the cytotoxicity study of the ethanol, methanol and ethyl acetate extracts of Vernonia amygdalina and observed the morphological changes in human glioblastoma multiforme cell lines (U-87). Vernonia amygdalina extracted already been known for rich in antioxidant polyphenols and had been studied for their anticancer activity against various tumours [18,19]. Study from Khalili et al. had revealed that Vernonia amygdalina extracts shown to be cytotoxic towards MCF-7 and HT-29 cancer cell lines. The study then had concluded that Vernonia amygdalina extracts may had the potential to be used as a new cancer therapeutic treatment than surgical procedure . Nevertheless, in this study done with three solvents polarity used, only ethyl acetate extracts displayed cytotoxic activity to U-87 cell line compared to ethanol and methanol extracts. This may be attributed to the highest phenolic compound content of Vernonia amygdalina extract in ethyl acetate in previous study done using Ferric Thiocyanate (FTC) and Thiobarbituric Acid (TBA) method . Nevertheless, whether this compound can ever be selectively cytotoxic on other glioblastoma cells under the same conditions was not known and not confirm. But, Wong et al. had detailed that as an extract from the plant covers numerous different active biological compounds, it is possible that the irregularity of Vernonia amygdalina benefits is due to batch variation, in which certain batches may have high anticancer activity than another batch. Despite the discrepancy of IC50 values, the previous study had yet confirmed the anticancer activity of Vernonia amygdalina in MCF-7 cells [20,24] and HT-29 cells . These results suggest that Vernonia amygdalina able to act as anti-cancer irrespective of some cancer cell lines. As a conclusion, this study had achieved its aim, but there was an unavoidable financial aid limitation. Because of this limitation, this study needs to cut-off some of the methods (Annexin V-FITC, Caspase-3 activity) that need a high budget	to be done. MTT assay is the basis for numerous in vitro assays that includes only the measurement of cell viability and proliferation. With present result and literature reviews, this plant could be an important source of safer cytotoxic compounds with further exploration. Thus, specific mechanisms of anti-proliferative effects of Vernonia amygdalina extracts using Annexin V-FITC, Caspase-3 activity and Western blot analysis will add much more value to this study overall in the future. It was intimated that more trials should be further conducted on a bigger scale to evaluate the efficacy of the proposed treatment. National Cancer Institute (NCI). Glioblastoma multiforme, 2015. Holland EC. Glioblastoma multiforme: the terminator. ProcNatlAcadSci U S A 2000; 97: 6242-6244. Esteller M, Garcia-Foncillas J, Andion E, Goodman SN, Hidalgo OF. Inactivation of the DNA-repair gene MGMT and the clinical response of gliomas to alkylating agents. N Engl J Med 2000; 343: 1350-1354. Scrideli CA, Carlotti CG, Okamoto OK, Andrade VS, Cortez MA. Gene expression profile analysis of primary glioblastomas and non-neoplastic brain tissue: identification of potential target genes by oligonucleotide microarray and real-time quantitative PCR. J NeuroOncol 2008; 88: 281-291. Buchanan DR, White JD, OMara AM, Kelaghan JW, Smith WB, Minasian LM. Research-design issues in cancer-symptom-management trials using complementary and alternative medicine: lessons from the National Cancer Institute Community Clinical Oncology Program experience. Off J Am SocClinOncol 2005; 23: 6682-6689. Richardson MA, Sanders T, Palmer JL, Greisinger A, Singletary SE. Complementary/alternative medicine use in a comprehensive cancer center and the implications for oncology. J ClinOncol 2000; 18: 2505-2514. Huda-Faujan N, Noriham A, Norrakiah AS, Babji AS. Antioxidative activities of water extracts of some Malaysian herbs. ASEAN Food J 2007; 14: 61-68. Harborne JB. Arsenal for Survival: Secondary Plant Products. Taxon 2000; 49: 435. Livingstone J. Natural compounds in cancer therapy. Int J Pharma Med 2001; 15. Schwartsmann G, Winograd B, Pinedo HM. The main steps in the development of anticancer agents. J European SocTherapRadiolOncol 1988; 12: 301-313. Parillo M, Riccardi G. Diet composition and the risk of type 2 diabetes: epidemiological and clinical evidence. Br J Nutr 2004; 92: 7-19. Grubben GJH. Plant resources of tropical Africa (program). Backhuys 2004: 667. Mueller MS, Mechler E. Medicinal plants in tropical countries: traditional use, experience, facts. GerogeThiemeVerlag Stuttgart 2005: 147-148. Atangwho IJ, Ebong PE, Egbung GE, Eteng MU, Eyong MU. Effects of Vernonia amygdalina Del: leaf on liver function in alloxan induced hyperglycemic rats. J Pharm Bioresource 2007; 4: 1-7. Atangwho IJ, Ebong PE, Eyong EU, Eteng MU, Obi AU. Effects of Vernonia amygdalina Del: leaf on kidney function of diabetic rats. Int J Pharm 2007; 3:143- 148. Atangwho IJ, Ebong PO, Eyong MU, Eteng MU, Uboh PE. Vernonia amygdalina Del: A potential prophylactic antidiabetic agent in lipids complication. Glob J Pure Applied Sci 2007; 3; 103-106. Nwaoguikpe RN. The effect of extract of bitter leaf (Vernonia amygdalina) on blood glucose levels of diabetic rats. Int J BiolChemSci 2010; 4: 721-729. Lansky EP, Newman RA. Punicagranatum (pomegranate) and its potential for prevention and treatment of inflammation and cancer. J Ethnopharmacol 2007; 109: 177-206. Turrini E, Ferruzzi L, Fimognari C. Potential Effects of Pomegranate Polyphenols in Cancer Prevention and Therapy. Oxid Med Cell Longev 2015; 2015: 938475. Khalili MA, Hadi NA, Naim R, Baig AA, Mahmud K. Study on antioxidant capacity and anticancer activity of Bismillah leaf (Vernonia amygdalina). W J Pharm Res 2014; 3: 14-29. Amarowicz R, Naczk M. Antioxidant activity of condensed tannins of beach pea, canola hulls, evening primrose and faba bean. J Food Lip 2000; 7: 195-205. Jisaka M, Ohigashi H, Takegawa K, Huffman MA, Koshimizu K. Antitumoral and antimicrobial activities of bitter sesquiterpene lactones of Vernonia amygdalina, a possible medicinal plant used by wild chimpanzees. BiosciBiotechnolBiochem 1993; 57: 833-834. Kupchan SM, Hemingway RJ, Karim A. Werner D. Tumor inhibitors. XLVII. Vernodalin and vernomygdin, two new cytotoxic sesquiterpene lactones from Vernonia amygdalina. J Org Chem 1969; 34: 3908-3911. Wong FC, Woo CC, Hsu A, Tan BKH. The Anti-cancer activities of Vernonia amygdalina extract in human breast cancer cell lines are mediated through Caspase-dependent and p53-independent pathways. PLoS ONE 2013; 8: e78021. Merlin NJ, Parthasarathy V, Santhoshkumar TR. Induction of apoptosis in human breast cancer cell line MCF-7 by phytochemicals from Gmelinaasiatica. African J Biotech 2010; 9: 4451-4456. Mosmann T. Rapid colorimetric assay for cellular growth and survival: application to proliferation and cytotoxicity assays. J Immunol Meth 1983; 65:55-63. Smit HF, Woerdenbag HJ, Singh RH, Meulenbeld GJ, Labadie RP. Ayurvedic herbal drugs with possible cytostatic activity. J Ethnopharmacol 1995; 47: 75-84. Moskwa J, Borawska MH, Markiewicz-Zukowska R, Puscion-Jakubik A, Naliwajko SK. Polish natural bee honeys are anti-proliferative and anti-metastatic agents in human glioblastoma multiforme U87MG cell line. PLoS ONE 2014; 9: e90533.